Tension headaches plague as many as nine in ten people. Characterized by constant, throbbing head pain that recurs on a regular basis, these headaches are often related to tight shoulder and neck muscles. Unfortunately, many turn to short-term sources of relief for the headache itself, which temporarily decreases the pain but does nothing to address the musculoskeletal problem. If you suffer from chronic headaches that continue for at least half an hour, our chiropractic team at Lubbock Advance Physical Medicine has an all-natural solution that may work for you. At Lubbock Advanced Physical Medicine, we work hard to provide long-term, all-natural pain relief for many types of headaches. Instead of treating your surface symptoms, our Lubbock chiropractic team will do our best to identify your headache triggers and help you eliminate them. Tension headaches have a variety of causes, so we will ask about your lifestyle, environment, diet, and more. Once we figure out which patterns your headaches follow and which factors may contribute to them, it may be easier to predict and manage your symptoms. If any of these triggers sound familiar to you, you may have tension headaches. These headaches occur because of stress and tension in the neck, jaw, and head. Sometimes, that manifests as spasms in the sensitive RCPM muscle at the base of your skull. Other triggers may cause misalignment, which chiropractic techniques are designed to correct. While chiropractic adjustments correct misalignment , one of the most effective ways to relieve RCPM pain is to block signals to the nerve bundle inside it. 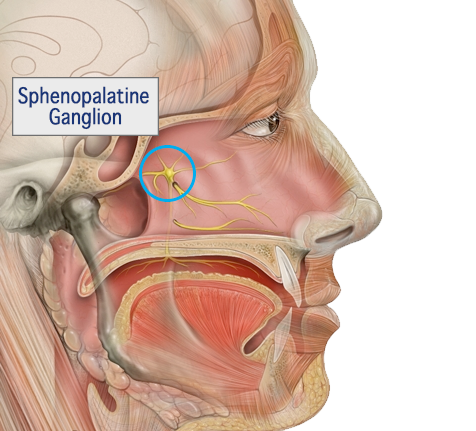 At Lubbock Advanced Physical Medicine, we're proud to use state-of-the-art headache treatment technology to target the sphenopalatine ganglion (SPG), the bundle of nerves inside the RCPM muscle. Our most innovative solution is the MiRx™ Protocol, an SGP nerve block technique. This headache treatment doesn’t require any harsh pharmaceuticals or invasive surgical methods, and it's effective at relieving severe headache pain quickly. The MiRx Protocol allows us to easily and efficiently access the sensitive nerves in the SPG. Unlike older techniques, which took much longer and were far less precise, our new nerve block technique offers immediate results and is easy to perform. We recommend the SPG nerve block for patients with recurring tension headaches, as well as migraines, especially if lifestyle modifications do not reduce or alleviate the pain caused by these chronic health problems. Thanks to innovative treatment technologies, tension headaches are both preventable and treatable. Say goodbye to throbbing head pain, and call us today to schedule your appointment for tension headache treatment in Lubbock, TX.